Made by Kerry, Charles H in Australia, Oceania, 1860-1917. 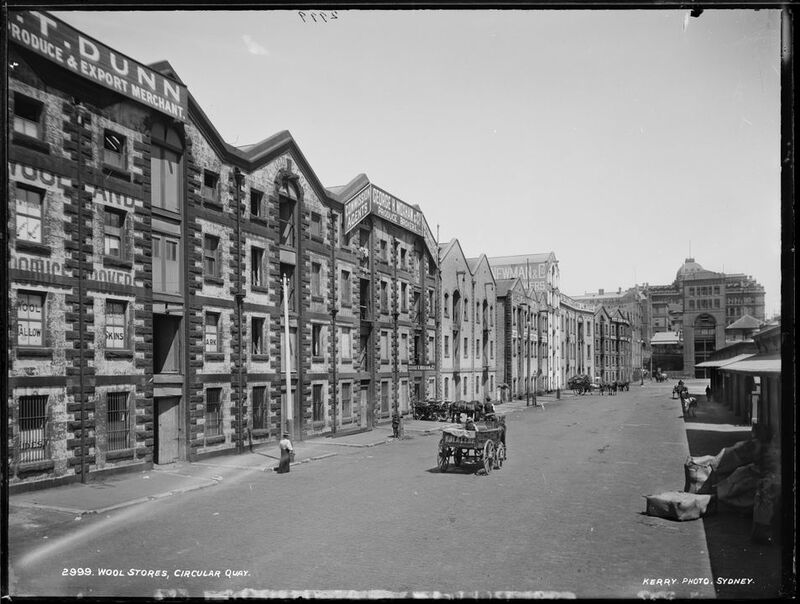 This image shows the wool stores along East Circular Quay in about 1890. Stores began to be built along here during the wool boom of the 1860s. Through the 1880s Sydney began to rival Melbourne and Geelong as the most important wool export market in Australia. By the 1890s, prominent names such as Hill, Clark and Co. and Pitt, Son and Badgery had stores on East Circular Quay. Wool stores and bonds extended along part of Macquarie street. Glass negative, full plate, 'Wool Stores, Circular Quay', Kerry and Co, Sydney, Australia, c. 1884-1917. Silver gelatin dry plate glass negative in landscape format. The caption, studio number and studio mark are inscribed on the reverse of the negative. The negative is not fully catalogued. Bottom right: Kerry Photo. Sydney.